Born in Los Angeles, Bill Myers worked as a building contractor and salmon fisherman in Alaska. During the 1970’s, Bill relocated to the bucolic town of Healdsburg, California, sold his boat, purchased his first vineyard in the Alexander Valley and began to make wine. With his newly purchased vineyard, a tiny tasting room and wine production facility just off the square in downtown Healdsburg, Bill started making wines. He quickly became recognized for producing wonderful Chardonnay, Zinfandel and what was to become White Oak’s flagship wine: Sauvignon Blanc. In 1991, Bill took home his first Sonoma County Harvest Fair Sweepstakes Award for his 1990 Sonoma County Chardonnay. In 1997, Bill formed an alliance with Burdell Properties to pursue his vision of expanding the winery and thereby creating the foundation of today’s White Oak. Don Groth and Burdell Properties brought over 750 acres of prime vineyards in Napa Valley and the Russian River Valley to the winery. Shortly thereafter Bill broke ground on this impressive Mediteranean-style winery in the most scenic area of the Alexander Valley. 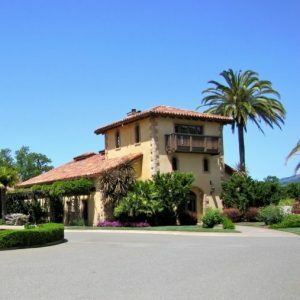 The estate is nestled amongst seventeen acres of Zinfandel vines dating back to 1929 and 1935. Bill then added small lots of Merlot, Cabernet Sauvignon and Cabernet Franc to the estate. White Oak’s new tasting room in the Alexander Valley opened in October of 1998. Our tasting room staff is enthusiastic and knowledgeable. We participate in many of the annual Alexander Valley and Russian River Valley wine road events and members of our Wine Club enjoy four Winery events throughout the year. Presently, White Oak Vineyards & Winery has nearly 750 acres of vineyards divided between the Napa, Alexander and Russian River Valleys. Roughly 10% of this fruit is used in White Oak wines with the balance being sold to other well known prestige wineries. We are currently producing five artisan quality wines for national distribution and two Estate wines, which are only available through our tasting room. Please call the winery for availability. The White Oak Tasting Room and Hospitality Center is open daily * from 10 am to 5 pm. Wine tasting is fee based, refunded with taster purchase. Tours by appointment only.